Prior to this project, ONA had their conference resources spread across individual conference sites, and it was often challenging for users to find what they needed within the incredible back catalog of ONA conference content. The goal for this project was to build one centralized site to index all conference resources – past, present, and future – for users to browse and reference. 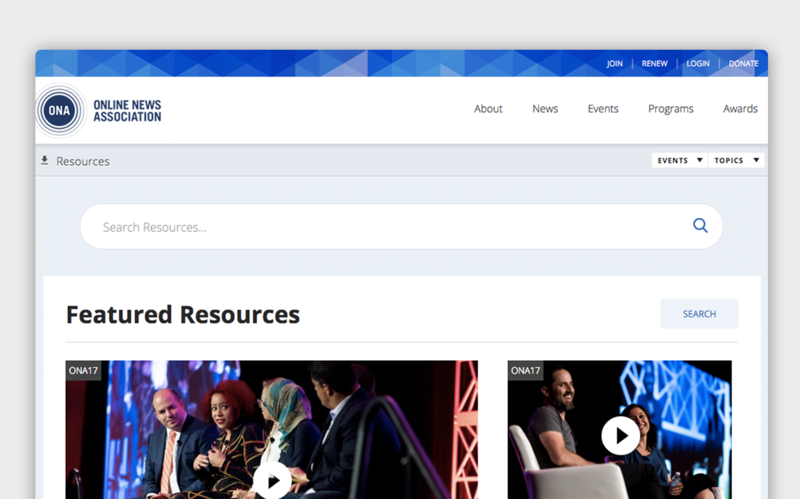 This new portal includes hundreds of hours of materials such as podcasts, videos, presenter profiles, and written content produced for or during ONA conferences. Alley designed the new portal from scratch, ensuring an easy-to-use, seamless experience for ONA’s visitors. We also set up a regular, automatic content sync from former conference sites to the newly launched site utilizing the WordPress REST API. All relevant resources are now up to date and will continue to be for as long as the site shall live. Video and audio is prominently featured along with full transcripts, and users can learn more about presenters and explore other content they've generated for past conferences. Resources are easily filterable inline, so anyone interested in specific topic areas can find exactly what is most relevant to them. Finally, we are able to pull in content from all over, including third parties, such as Trint, Scribble, and Livestream so that however you learn, whatever you’re looking for, you’ll be able to access it quickly and easily. The portal launched to great fanfare at the ONA 2018 conference in Austin, Texas. It's still too early to provide full results, but the reception in person and on social has been very positive. We look forward to helping ONA grow this portal as more and more content becomes available.